I’m a DC native who moved to South Florida in 2001. I’m an avid gamer and coder, and I’ve been an entrepreneur for as long as I can imagine, always trying to find the next big thing. In 2010, I founded my first company, CCRT. A computer repair service, we were always finding ways to improve our business and our company’s income. That’s when this adventure began. You see, as part of CCRT, we decided it would be beneficial for me to learn programming. That’s when I picked up Java. I basically ate, slept, and coded. That was my life for 6 months while I learned the skills of the craft and we released our first application. That application would be what set it all off. At first downloads were slow, it was tough getting traction. Than something happened – like flicking on a switch. The downloads kept growing, and at one point we were getting over 10,000 a day. We went viral! This was now truly eat, sleep, code mode. It was two or so years managing this application and it’s million or so users when I decided it was time to persue something I’ve always dreamed about doing: Gaming. I moved to Exano Software, where I made and released games the way I wanted to, games that I had made. This had moderate success, and spun me off many small contracts and jobs .One of the more impactful, was Stocket. Stocket was a good opportunity. I worked as Lead Developer there for a couple of years, gaining good experience, leading a team, and working with some great people. I honed my skills, and worked on AR and VR applications with some friends I met at work. Those friends would prove invaluable as I left Stocket, publishing VR games on Steam, and contracting out applications and work to Universities and businesses. The four of us are paving the way to a future where AR and VR are ways of life. We are just getting started, and the story isn’t over yet. Stocket was an E-Commerce mobile game. Revolutionizing Commerce and Gaming, Stocket put you in control of a store to raise and grow. Sell out the customers, make more sales, and become a baller, purchasing Jets, Stadiums, and more. Expand the store, manage staff, and use special power-ups and become the stockstar! Partnered with over 1,000 brands including Best Buy, Crocs, Wal-Mart and more, Stocket is the first mobile game to put you in control of real products, and real brands. Outpost L5 is an old school arcade shooter. Just, in VR! Take control of a craft defending earth from a slew of familiar creatures, and enjoy a twist on an old classic. Looking down, you’ll see a familiar arcade screen and controller, but outside, you’ll see dozens of creatures making their way to Earth. As the last Outpost, can you stop their arrival? Outpost L5 has been featured on many YouTube streams, the Indie Gala and Steam Sales, and some others. It currently has a new content patch under development. Square Dance was my very first game. A 2D brick breaker in a 3D world, which allows you to select a combination system to dictate the rest of the game. Upgrade your paddle and class and fight in over 60 levels complete with 10 bosses, or play endless mode and enjoy over 60 million random worlds. 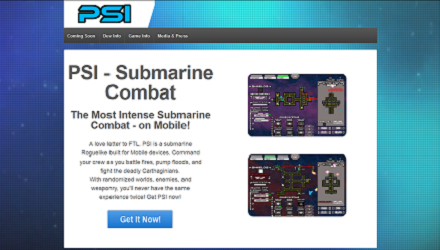 A call out to FTL, PSI lets you create and build your own submarine as you take across the ocean to defeat an enemy general. Control your weapons, shields, ballast and engines as you keep your systems online, prevent floods and put out fires while in deadly combat. Also featuring side quests and a free roam ocean, PSI is a nearly endless experience. This video has a slow framerate as it was recorded directly from a phone that couldn’t handle it. Alpha Commander is an homage to Missile Command. Featuring beautiful graphics and classic gameplay. Defend your city from the incoming ICBM’s — but be careful! You only have 30 missiles! Complete with dynamic weather systems, day/night cycles, and plenty of easter eggs, Alpha Commander is a classic arcade experience on your phone or tablet.Integrated with Facebook and the iOS Game Center / Play Games as well as my website. NAVZ1 is a horror survival game developed by Sony. The game features a distinct lack of maps and navigational tools — which makes finding your friends very difficult. To fix this problem, I created the NavZ1 Navigational Aid. You type a command in the game, and ask your friend to do the same (Or use a stored landmark as a favorite), and the application will compute the direction you need to face in order to reach your target in the shortest time possible. The Space Engineers handbook is a tool for fans of the Space Engineers game. Dynamically pulling content as it updates from my website, the Space Engineers Handbook ensures you will always be up to date with the game. This application allows users of Space Engineers to quickly calculate what materials they require to create blocks and objects in the game. Complete with the ability to scale up multiple items in the tens of thousands, and create a dynamic shopping cart for all of your asteroid mining needs. Fast Text was one of the first utility apps I created. Applying Apple’s concept of quickly texting from the main screen, along with quick reply/decline icons, Fast Text lets you get back to your life faster. This app also is one of the few Android applications to feature transparent overlays and background movement while not freezing your actual home screen, letting you quickly text somebody without worrying about leaving your app behind and losing progress or your place. DIY Live Wallpaper is an app that lets the user create limitless wallpapers for their phones home screen. Save your favorites, select from premade wallpapers, or tweak the wallpaper to your hearts content! Get rid of boring static wallpapers forever! Since I don’t have enough room to link all of the applications I created, click here for a full link to my Google Play portfolio! PSI’s website was developed to market PSI for iOS and Android. A simple page compatible with mobile devices, with the design only on one page. This was the first site I developed featuring moving backgrounds. 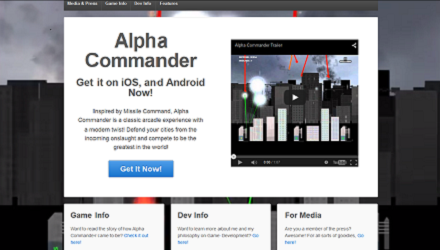 Alpha Commander was a website created to market my iOS and Android title. It was the second site to feature full backgrounds, and was also designed to fit on one page and be mobile compatible. This site is also the host of the high scoreboards for Alpha Commander on iOS and Android. 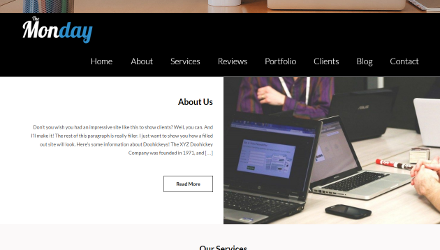 A demo of a generic WordPress Site. It’s using The Monday and has some small tweaks and adjustments made. Designed to showcase my knowledge of WordPress and the themes and extensions. I have also written my own scrapers and parsers for use in mobile applications, as well as PHP scripts to interact with various ends of the above websites. Please ask about the consulting I have also provided consulting to various businesses. I have developed numerous applications and games for Android, iOS, Steam, SteamVR, Windows Phone 8, as well as PC. I’ve also developed applications utilizing JSON/REST API’s. I have experience manipulating certain services/listeners within Android, specifically the messaging service. I’ve got a keen interest in working with VR and AR. Focusing on Vive/Occulus platforms, I’ve already published one VR game on steam for VHornet. Please see the links to the side for more detailed information on my projects. In addition, I am experienced in general IT, with extensive knowledge in hardware, Microsoft software, virus removal and protection, and general security. My third animation, made for the engine reboot screen on The Bridge. Check out my prototype videos to see how it works in game! This was my fifth animation, made for the weapon boot up screen on The Bridge. Check out my prototype videos to see how it works in game. My second animation, a general systems reboot for a company in The Bridge. Check out my prototype videos to see more! All of these animations will be used in the prototype games to come. All animations were made in DreamWeaver. Campaign Trail is a project due to be released within the next two months. Select a candidate and run for city mayor! Ultimately you are in charge of hiring staff, training, firing, advertising and managing your campaign. Do you have what it takes to become President of the United States? This is a small WIP using a render texture and two cameras. I get the texture coordinates from the first raycast and pass them through to a second camera. A little bit of layering and the end result is pretty neat! This will serve as a foundation for a couple of projects in the future, as well as The Bridge. *NOTE* This video was prepared for personal use/friends. It’s a prototype video and a work in progress and is subject to change. Space station story is an upcoming title slated for release this fall, targeting mobile and iOS. Build and command a colony in the stars, managing garbage collection, shipments, housing, food and more all while battling alien threats, fires, and system failures. Video demonstrating room CO2/O2 propegation on The Bridge. Video demonstrating ship systems on The Bridge. A first person ship game based on being the commander of your own starship. Want my Resume? That’s great! I’m interested in hearing about all opportunities and would love to hear from you. Alternatively, you can download a PDF copy of my resume! Click here for the full (2) page Resume. Click here for the abridged (1) page Resume.